by Chris Woodford. Last updated: May 16, 2018. Do you ever find it tricky communicating by telephone—when you can't see the person you're talking to, watch their facial expressions, and figure out how they're reacting to the things you say? Imagine, then, how much harder phone conversations would be if you had a hearing impairment, especially if you relied on visual techniques like lip-reading or sign language. It's ironic that early telephones were designed for people with perfect hearing because Alexander Graham Bell, generally credited with their invention, was particularly aware of the problems deaf people faced: he had, after all, established a school for the deaf years before he became famous and his wife Mabel (one of his former pupils) was deaf as well. Thankfully, better technology has since enabled the development of phones that hearing-impaired people can use much more easily. Let's take a closer look at how they work! 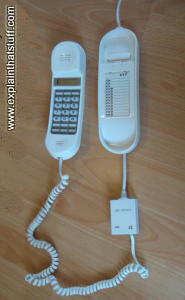 Photo: This telephone for hearing-impaired people, designed by Geemarc, has lots of extra features. You can amplify the headset and microphone volume. There's a loud ringer and a xenon strobe light (the white bar running along the bottom) flashes brightly to alert you to incoming calls. The LCD display at the top tells you who's calling (by checking the number of a call against an address book of stored names). 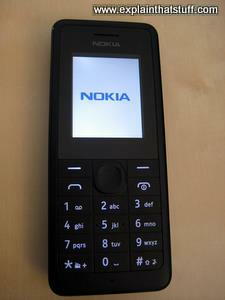 Most of the extra features can be turned on and off so the phone is just as easy to use if you have normal hearing. Extra-big buttons help people who also have visual impairments. 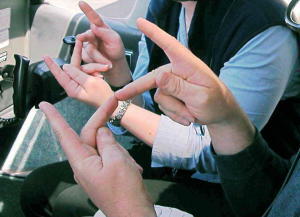 Photo: Deaf and hearing-impaired people rely on visual information to a much greater degree, like these two people communicating through sign language. But most can still use telephones and related technology as well. Photo by Wendy Beauchaine courtesy of US Air Force. The simplest and crudest solution to improving a phone for someone with a hearing impairment is obviously to make it louder. On an amplifying phone, the loudness of the handset volume is usually adjustable up to a maximum of about 100–150dB (people without hearing impairment would find this painfully loud), though the microphone volume is usually adjustable too (useful if one deaf person is talking by phone to another). Since telephones are generally used by more than one person, sound amplification may be switched on or temporarily "boosted" by pressing a button just for the duration of a call. Often the tone (treble-bass level) of the sound in the handset can also be adjusted to match a person's particular hearing loss. If you like your existing phone and your hearing difficulty is more moderate, you could invest in a telephone amplifier. The simplest ones are little boxes that clip or strap onto the handset earpiece of a normal phone. They have a microphone one side (which faces the phone loudspeaker), a loudspeaker the other (which faces your ear), and a battery-powered amplifier unit in the middle. Artwork: How a simple telephone amplifier works. This one is a headset that can pick up sounds either from a built in microphone or an inductive coupler (explained in more detail below). You hold the phone handset (green) near the microphone (blue) and an amplifier in the ear units (red) boosts the sound into two small speakers (yellow) that pass sounds either directly into your ear canals or to your conventional hearing aid. 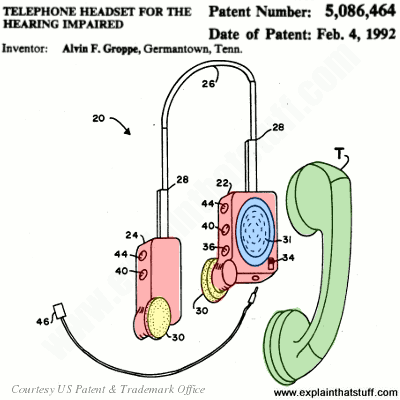 Artwork from US Patent 5,086,464: Telephone headset for the hearing impaired by Alvin F. Groppe, courtesy of US Patent and Trademark Office. More sophisticated "in-line" amplifiers fit in between the handset and the base unit so they interrupt and boost the current going from the base to the handset loudspeaker, making the sound louder that way. Some have tone controls for added refinement of the amplified sound. Generally, amplifiers like this boost volume by about 20–40dB. 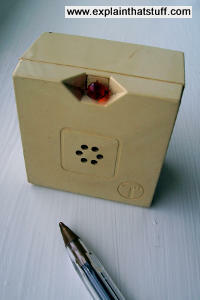 Photo: An in-line telephone amplifier is a little box that fits between the handset and the base of a conventional phone. To use one of these, you'll need a reasonably modern phone with a detachable handset that links to the base with a standard RJ11 connector. In-line amplifiers take about a minute to connect. Phones for the hearing impaired generally have much louder rings (a maximum ring volume of 80dB is typical) and visual or vibrating alerts (bright flashing strobe lights or vibrating buzzers similar to those in cellphones and pagers). Hearing-impaired users often like to have a number of extension bells and you can buy plug-in ringers (small boxes that ring and flash) to fit to extension sockets around your home. Some phones have LCD displays with caller identification (also known as caller ID or caller display) so you can see who's on the line before you decide whether you want to answer. Others can be programmed to speak aloud the name and details of a caller in a loud, clear voice (useful if a person has visual as well as hearing impairments). Photo: A typical plug-in ringer. This one, made by BT in the 1980s, has an electronic beeper and a flashing red LED lamp. It fits into a standard telephone socket with an RJ11 connector. Photo: In movie theaters and concert halls, look out for signs like this that indicate induction loop hearing assistance is available. The same technology is built into hearing-aid-compatible telephones, which generally have a T switch on them somewhere. A hearing aid is an example of electromagnetism in action: it uses a microphone to pick up and convert sounds to electricity, which it then amplifies and turns back into louder sounds in a person's ear using a miniature loudspeaker. The quality of the amplified sound can sometimes be poor or confusing because a hearing aid will generally amplify background noise as well as the sounds you actually want to hear. When those sounds are produced by a loudspeaker of some kind, such as the one in a telephone, a person with a hearing impairment can often produce a clearer, more audible sound in their ear by induction coupling: linking their hearing aid directly, electromagnetically, to the sound source and switching off the microphone in their hearing aid. Public places such as theaters and concert halls are often fitted with induction loops, which are large circuits of wire fed with electrical signals from the same source driving the main loudspeakers. As the signals travel around an induction loop, it produces a small, safe, fluctuating magnetic field all around it. Compatible hearing aids will pick up these fields using a smaller loop of wire (called a "telecoil") inside them and convert them directly into sounds. Effectively, you get a direct "feed" of the loudspeaker to your ear, so your hearing aid receives only the sounds you want to hear and not the background noise. Compatible hearing aids have a switch on them called the T setting that allows them to pick up signals from induction loops. 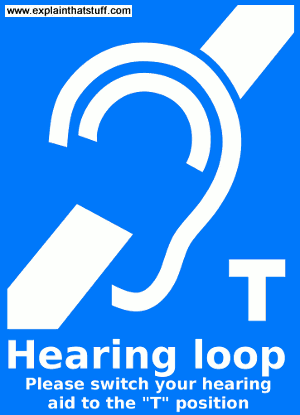 Virtually all phones designed for hearing impaired people can be used with inductive coupling in this way. 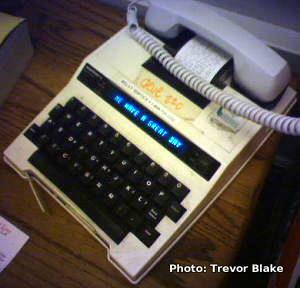 Photo: A typical TTY phone, probably dating from the 1980s. Note how the phone handset sits in an acoustic coupler on top. There's a keyboard for sending messages and a one-line display for receiving them. There's also a little printer (under the phone handset in the center) for printing out conversations. Photo by Trevor Blake published on Flickr under a Creative Commons Licence. If you have a profound hearing impairment, technologies like amplification and inductive coupling may be little or no use. One solution is to use a telecommunications relay service (TRS) and a TTY (teletypewriter) phone (also known as a minicom or textphone in some countries), which looks a bit like a laptop computer with a keyboard, a small (typically one-line) display, and two round plugs at the top where you sit your phone (sometimes called an acoustic coupler). TTY phones can be used in various different ways. If both users have TTY equipment, you can simply type messages at one end and have them appear on the display at the other end. If a user with a conventional phone wants to communicate with someone who has only a TTY phone, typically they'd speak to an operator who'd listen to the words, type them out, and relay them over to the display on the user's TTY phone. Although many people still rely on TTY phones, they're less relevant now alternative technologies exist, such as fax, email, SMS text messaging on cellphones, and IM (instant messaging chat) over the Internet with free programs such as Skype. Photo: Cellphones have traditionally been difficult for hearing-impaired people to hear clearly, but they're now improving rapidly thanks to advances in technology and changes in legislation. Some countries have been more responsive to the needs of hearing-impaired people than others. In the United States, it's over 20 years since Congress passed the Hearing Aid Compatibility Act of 1988, effectively prompting phone manufacturers to make more of their equipment usable by hearing-impaired people. Cellphones (wireless, mobile phones) were specifically exempted from this law because, at that time, they were still very new and the politicians didn't want to hamper the development of the technology. Since then, things have moved on. The Federal Communications Commission now requires specific levels of compatibility between hearing aids and cellphones and places requirements on wireless service providers to offer a choice of compatible equipment to their customers. Unfortunately, similar standards don't always exist in other countries, but raising the bar in the United States will undoubtedly help better equipment to become more widely available elsewhere. Hearing Aid Compatibility for Wireless Telephones: This article from the Federal Communications Commission sets out what help you can expect from wireless service providers. Telecommunications Relay Services (TRS): Another useful article from the Federal Communications Commission explains everything you need to know about TRS in the United States. National Institute on Deafness and Other Communication Disorders: Lots of general background about hearing loss and deafness. Independent living if you are deaf or hearing impaired: A helpful summary of advice from the UK government (via the Wayback Machine). Action on Hearing Loss: This UK charity, helping the deaf and hard-of-hearing, has a clear, easy-to-use website with lots of good background information. Their store sells various kinds of telephone aids for the hearing impaired, and raises money for the charity. Hearing Loss Association of America: The (US) nation's voice for people with hearing loss. Their telephony page covers landline and cellphones, captioned phones, and state equipment distribution programs.